Jokari®: Clippings mentioning the game. From the JHB Sunday Express, Nov 26, 1950. "Jokari, a game which members of the M.C.C. and Natal cricket clubs allege smartens up their batting eye, was demonstrated by Bob Crisp, Mr. and Mrs Norman Farquharmon and Paul Winslow.--among others--on the roof of a big Johannesburg deparmental store last week. The game is based on tennis, but is played like squash. Some Natal batsmen are reported to play it just before they go out to bat." The need for regular, conditioning sets of jokari is at once apparent, and the bottle caps should make excellent roulette counters. ...."
Here is something that should amuse you--it certainly did me. Natal cricketers Dudley Nourse and Dereck Dowling were having a hard, three-set game of "Jokari"--the strenuous new pastime now catching on rapidly among sportsmen. He did to good effect. I lost 11-15." This next article strikes me as what we call "hype"
The persons in the story are evidently well known sports figures. The overall thrust was to a different audience in the '50s than are evinced by the quality of today's equipment. 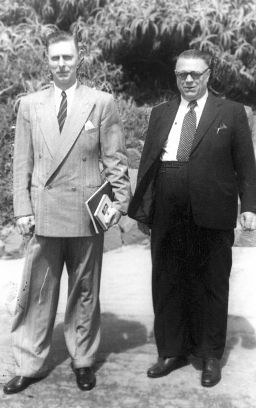 "Nourse and Dowling appear to be enjoying themselves in this picture, but it was far from being the case. In 10 minutes they were wet through. Nourse, new to the game, just lost to Dowling, who has been playing for two weeks, but later just beat Bob Williams by the off point. Jack Gage (left) and Williams both soon got the hang of things after a little tuition from Ron Tilley (partly obscured by Nourse). "Those who saw Derek Dowling hit the first century on Saturday must have been pleasantly surprised at the confident manner in which he attacked the Tech bowling and wrecked the analysis of Les Payn and Newton Harrison. Dowling attributes his splendid early season form--216 runs over the week-end to "Jokari," a sport new to the Union. He thinks it has sharpened up his eyes to a tremendous extent. "An offshoot of the famous Basque game called Pelota, "Jokari," is really squash--without a court. It consists of a rubber ball attached by a length of strong elastic to a box, which can be put down on any level grass, clay, or concrete surface, and a game readily set in motion. One, two, three, or four can play at a time. "'Jokari,' was brought to the Union recently from England by a Durban business man. Dowling heard about it and tried it out. He considers the two weeks he has had at it have done him a lot more good than his net practices. "English cricketers obviously think highly of "Jokari," for James and John Langridge play it and have introduced it to the Sussex county side, and Godfrey Evans took a set aboard the Stratheden and had daily work-outs with Denis Compton. "Played extensively on the Continent, the game is said to be rapidly catching on in English-speaking countries. In the English speaking countries. In the Union, cricketers and tennis players are likely to become its firmest devotees. At the same time it is a sport likely to appeal to everybody. "The pace of the game for top class athletes is terrific. The sponge rubber ball comes back at the striker with a greater speed than any fast bowler makes off the wicket. For those not so fit, or for youngsters, special sets are made. The game is to be manufactured locally." From the Cape Times, April 3, 1951. DUDLEY NOURSE, the Springbok cricket captain (right) is a devotee of the new game jo-kari as a means for keeping his eye in, and here he is seen taking part in an exhibition of the game in a city store yesterday with a Natal player, Ron Tilley. 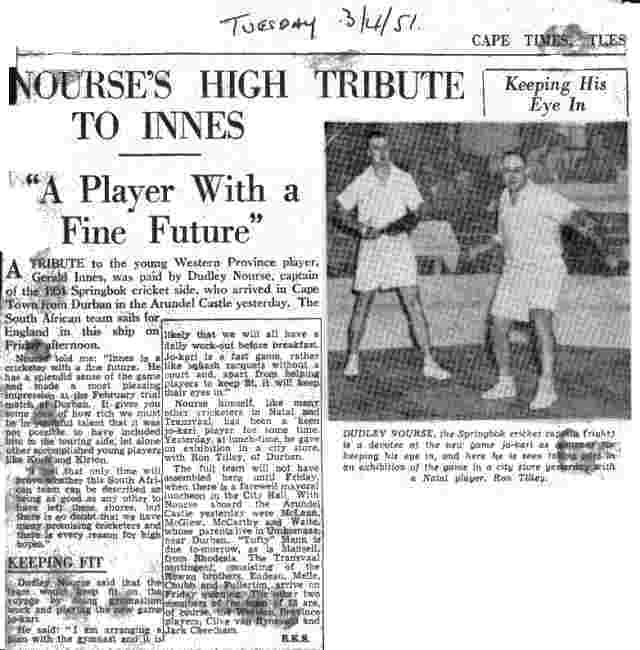 A tribute to the young Western Province player, Gerald Innes, was paid by Dudley Nourse, captain of the 1951 Springbok cricket side, who arrived in Cape Town from Durban in the Arundel Castle yesterday. The South African team sails for England in this ship on Friday afternoon. Nourse told me: "Innes is a cricketer with a fine future. He has a splendid sense of the game and made a most pleasing impression at the February trial match at Durban. It gives you some idea of how rich we must be in youthful talent that it was not possible to have included him in the touring side, let alone other accomplished young players like Kock and Kirton. "I feel that only time will prove whether this South African team can be described as being as good as any other to have left these shores, but there is no doubt that we have many promising cricketers and there is every reason for high hopes." Dudley Nourse said that the team would keep fit on the voyage by doing gymnasium work and playing the new game jo-kari. He said: "I am arranging a plan with the gymnast and it is likely that we will all have a daily work-out before breakfast. 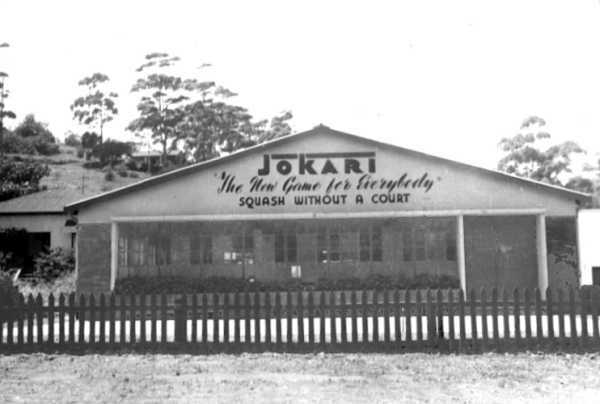 Jo-kari is a fast game, rather like squash racquets without a court and, apart from helping players to keep fit, it will keep their eyes in." Nourse himself, like many other cricketers in Natal and Transvaal, has been a keen jo-kari player for some time. Yesterday, at lunch-time, he gave an exhibition in a city store, with Ron Tilley, of Durban. Ronald Albert and Jacob George Tilley*, mentioned in the sports write-up above, are largely responsible for popularizing Jokari in South Africa. They sold the company to Dunlop in 1954 when they returned to the UK. *Father and grandfather, respectively, to David Tilley who provided this material. Assembled by ovk. Last updated 10/28/2003.